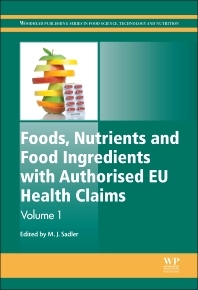 Foods, Nutrients and Food Ingredients with Authorised EU Health Claims provides an overview of how health claims are regulated in the European Union, as well as detailed scientific and regulatory information about permitted health claims for particular types of foods and ingredients. Part one provides a background to the regulation of health claims in Europe. Part two focuses on authorised disease risk reduction claims, claims relating to children’s development, and health and proprietary claims. Part three sets out ingredients with permitted “general function” claims, including choline, creatine, sweeteners, dietary lactase supplements, and polyphenols in olive oil. Part four outlines foods and nutrients with permitted health claims, with chapters on vitamins and minerals, proteins, meat, fish, water, and the replacement of saturated fats. Foods, Nutrients and Food Ingredients with Authorised EU Health Claims is the go-to resource for R&D managers and technical managers in the food, and beverage and dietary supplements industry, product development managers, health professionals and academic researchers in the field. Michele Jeanne Sadler is a Consultant Nutritional Scientist and Director of Rank Nutrition Ltd.